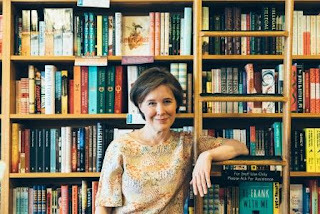 Boswell and Books: Tickets now on sale for Ann Patchett, in conversation with Jane Hamilton - Wednesday, October 19, 7 pm. Tickets now on sale for Ann Patchett, in conversation with Jane Hamilton - Wednesday, October 19, 7 pm. Announcing tickets for our event with Ann Patchett, author of Bel Canto, State of Wonder, and This is the Story of a Happy Marriage. Her new novel Commonwealth is one of the most anticipated novels of fall! And what a format! Patchett will be interviewed by Jane Hamilton, and honestly, I can't think of a better evening! Tickets are $28, including admission for one and a copy of Commonwealth, and all taxes and fees. We know it's tough to have a ticketed event when our October 19 event is a full month after release. So we've made it possible to pick your book for the event on or after September 13 release date. Simply choose "Early Pickup" when you purchase your ticket. Please note that this option is nonrefundable and will only be valid until September 12. If you are going to wait until the event, choose general admission. You'll get your copy of Commonwealth on the night of the event, and yes, there is a Boswell gift card option of $20 in lieu of the book, available on the night of the event only. Here's a little more about the new novel. One Sunday afternoon in Southern California, Bert Cousins shows up at Franny Keating's christening party uninvited. Before evening falls, he has kissed Franny's mother, Beverly, thus setting in motion the dissolution of their marriages and the joining of two families. Publishers Weekly raves: Patchett elegantly manages a varied cast of characters as alliances and animosities ebb and flow, cross-country and over time. Scenes of Franny and Leo in the Hamptons and Holly and Teresa at a Zen meditation center show her at her peak in humor, humanity, and understanding people in challenging situations. And Kirkus Reviews calls Patchett "one of our finest writers." Ann Patchett has been the recipient of numerous awards and fellowships, including Britain's Orange Prize, the PEN/Faulkner Award, the Harold D. Vursell Memorial Award from the American Academy of Arts and Letters, the Book Sense Book of the Year, a Guggenheim Fellowship, the Chicago Tribune's Heartland Prize, the Governors Award for Excellence in the Arts, the American Booksellers Association's Most Engaging Author Award, and the Women's National Book Association Award. In 2012, Time magazine named her one of the 100 Most Influential People in the World. And of course she is the co-owner of Parnassus Books in Nashville, Tennessee. Once again, here's the Brown Paper Tickets link to buy tickets! Here's the game of the day: how many books have you read in this author photo? Right away I see two from my reading list, Days of Awe from Lauren Fox and Julia Claiborne Johnson's Be Frank with Me.